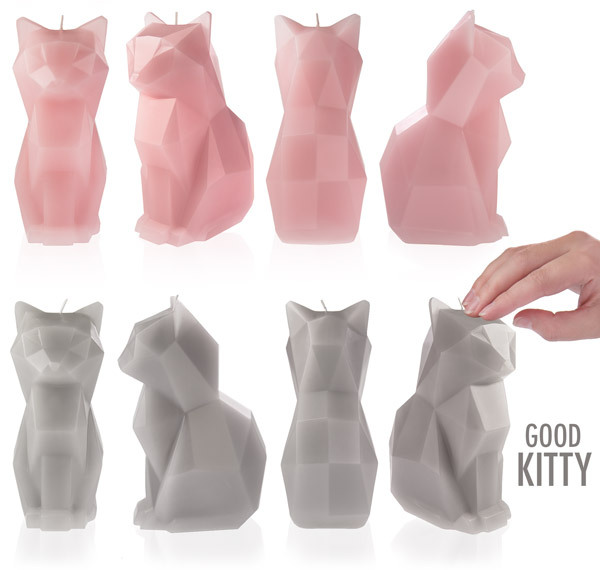 Decorate your home with the remarkable PyroPet Cat Candle. When lit, the geometric exterior transforms into a modern kinetic sculpture. As the PyroPet's wax melts away, a metal skeleton is revealed! Thanks to a stylized design both inside and out, PyroPet's metamorphosis is both mesmerizing and haunting, but never grisly. PyroPet is available in two colors: pink and gray. 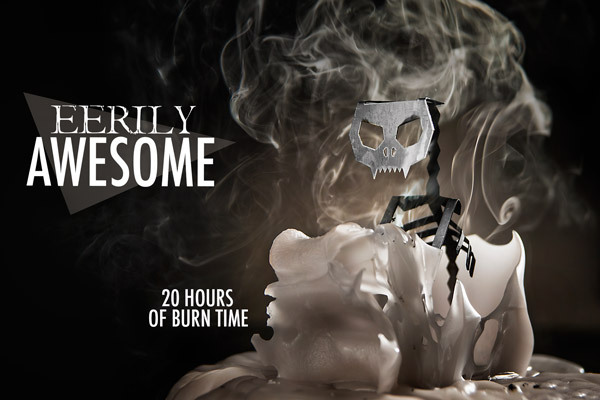 Features a 20+ hour burn time. Dimensions: 6.5" x 4.25" x 2.75"
The geometric design of this feline candle conceals a unique twist in wax sculpture: a hidden metal skeleton! As PyroPet's unscented wax burns away, the kinetic sculpture entrances with its dazzling transformation. The transformation from cute kitty to melted metal feline is a sight to behold! Its face literally melts away! Although the unique design of the PyroPet ensures that no two candles melt in exactly the same way, there is definitely a common pattern. As the wick burns down through the center of the head, you are treated to a few hours of what we like to call "Devil Kitty". This is when the flame dances directly behind the skeleton's eye sockets. As the flame bores down past the teeth, the face continues to hinge forward until the entire metal skull is revealed. Sweet! Eventually, the wick forges a path all the way to the bottom of the kitty, creating a pool of wax and revealing the ribs, pelvis, legs, and paws of the kitty's skeleton. 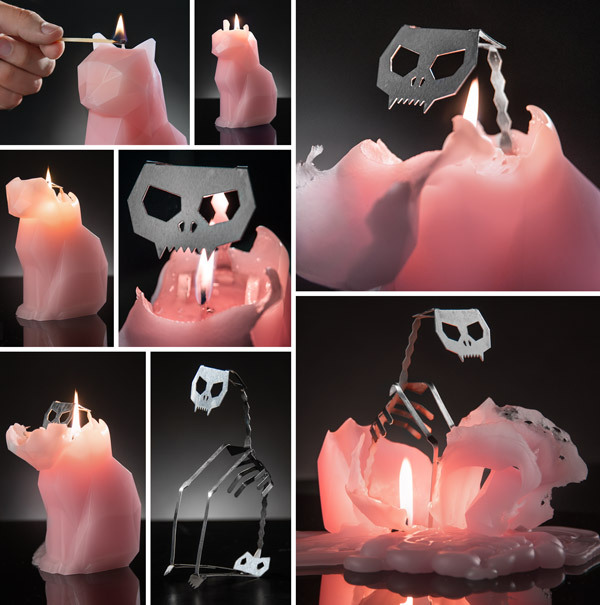 Burn the PyroPet Candle to reveal a hauntingly cool metal skeleton. PyroPet is currently available in two cat colors: pink and gray. We suggest gray for dreary Mondays and pink for your saucy weekends. PyroPet is available in two colors: pink and gray. Question: How long does it burn? Answer: The manufacturer states that the PyroPet's burn time is 20 hours. In our tests, it burned for approximately 25-30 hours. Please note that we would allow the cat to burn for about 8 hours, extinguish the wick, and restart burning the next day. It's possible that this extended the burn time. Question: Will owning a PyroPet turn me into a satanist? Answer: If that's all it takes, then we're all in big trouble! Question: Are there any other animals besides the cat? Answer: Currently, we only offer the kitty in two colors: pink and gray. Answer: No. They tried a burning flesh-scented fragrance, but it was too off-putting. We agree that the unscented wax was the correct choice.